First, let me start out with a story that makes me out to be a bit of a pretentious twit, so that I can later make the mild accusation that others are pretentious twits without sounding like I’m speaking from a particularly high horse. Now that I’ve pointed out my own folly, let’s talk about the concert itself. It was… pretty good. The musicians, members of a highly respected orchestra, were of course talented and played well. I commend them for volunteering to perform outreach such as this, and I wouldn’t be surprised to hear if they don’t receive any additional compensation for doing it. However, I wish to register some complaints, not to lambast the NJSO or these musicians in particular, but as a means of pointing out what I understand to be a common phenomenon: the phoned-in concert. Item 1. The highlight was a snippet of Isaac Stern’s fancy violin solos from Fiddler on the Roof; the rest of the programming was very safe, gentle, and of the love song persuasion. Take the three selections from West Side Story: “I Feel Pretty,” “Maria,” and “One Hand, One Heart” (I think; I tend to mentally wander off whenever love songs happen). All extremely unchallenging, you know? How about a fiery rendition of “America”? How about the tense, jazzy “Cool”? An even keel can get boring, guys. Change it up a little. Item 2. The group was a trifle unprepared. On two separate occasions, the cellist – who, it should be pointed out, was the best of the bunch – could not find his music and once had to run backstage to get it. The violinist forgot to turn off his cell phone. They both played these things off charmingly and it made for some laughs, but this sort of thing wouldn’t go down in a concert hall. Item 3. Riffing off the unprepared thing, there were some intonation problems, especially in the violinist, as well as some general group issues. The aforementioned “I Feel Pretty” was particularly sloppy. Interesting. So. Here’s the big question: Why? Where’s the cut off? Not to rag on the NJSO, but let’s break it down with their example. Was it because they were performing simple little Broadway tunes, and pfffft, who cares about Broadway? Was it because they were performing in a library in central NJ, and pfffft, who cares about the hicks in central NJ? * Was it because it was free, and/or they performed for free? Did they not make the program themselves, recognize it as a bit boring, and therefore not feel the need to put in the practice time? Or maybe it was because they only found out about their performance yesterday and didn’t have time to sufficiently prepare even if they wanted to? I’m sorry, NJSO. You guys were really good. I’m just saying: it was clear that you could have been much, much better. Not that it’s just you, anyway. And I’m wondering why. Anybody have thoughts on that, either as an audience member or a performer? When does one phone it in? * Not to suggest that central NJ is full of hicks. I have lots of family in NJ! I’ll defend it! Except the jughandles, which are STUPID. What’s up with the jughandles, Jersey? In the concert hall, how do you tell the seasoned sophisticates from the plebes? Easy! It’s all about knowing when to clap. Everyone knows that you hold your applause to the very end of the piece; that’s just how it’s done. 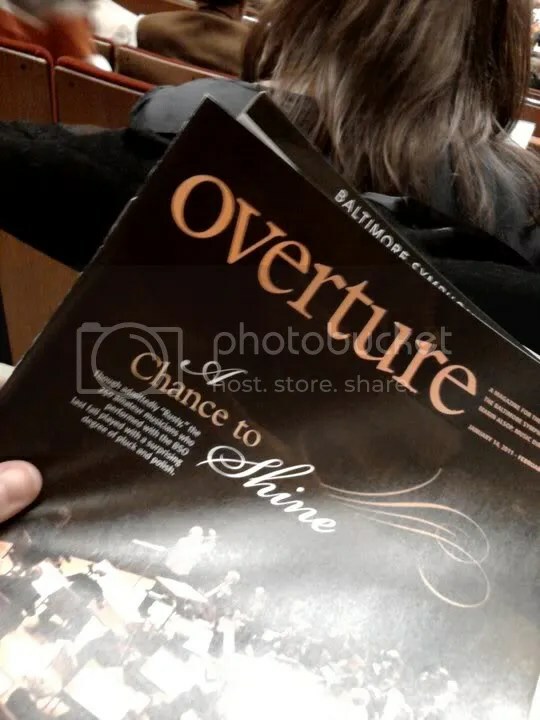 Last week I attended the Baltimore Symphony Orchestra’s concert featuring NADJA-SALERNO SONNENBERG, in which she played the Tchaikovsky violin concerto. She received a standing ovation. And no one minded, because she bloody well brought the house down, with her swaying and her stomping and her passionate frenzy of notes, but also with her smiles and winks and a playful spirit, just her and her buddy Piotr knocking out a few bars for the joy of it. She got a second, full-audience standing ovation after the third and final movement, because she’s NADJA SALERNO-SONNENBERG and don’t you forget it. But she’s by no means the only big-name concert violinist out there. I would even wager she’s not among THE most famous. A big deal, certainly, but somewhat less educated people might think first of, say, Pinchas Zuckerman, or for your more modern sensibilities, Hilary Hahn. I talked about this with my mother the other day, and she pointed out that both Hahn and Zuckerman are considered classicists, concerned with perfection and purity of form and note. To which I say: BOOOOOOORING. If you want perfection, program it into a computer. Who decided classical music has to be clean enough for surgery? And who decided that the only acceptable facial expressions are those of intensity or in some cases anger? Why can’t a soloist hunker down into the music and really ENJOY it? And, like, y’know, grin and stuff? The BSO followed NADJA with a performance of Stravinsky’s Rite of Spring, and again I say: it was too clean. This is music for pagan ritual; is it wrong to expect some rawness? I want a Rite that bleeds at the edges, but it seemed a study of caution as the watchword. No thank you. Bring back NADJA. Bring back classical music with some individual personality. So! I now invite your rebuttal. Do you think my acknowledged hero-worship of NADJA colors my opinion of her performance? Do you think Hilary Hahn is a goddess (CMcGo) and intend to murder me for my sins against her? Do you think perfection should be the goal after all? And if you do, answer me this: then why SHOULDN’T we just program our music into a computer and call it a day? Okay, longtime readers. I’m going to tell you something, and I don’t want you to panic. Last Thursday, I gave a standing ovation. This time it was awesome. Especially the second movement. It was perfect. My concert-going companion thought it should’ve been a slower still, and I see his point, but having thought it through I return to my original conclusion: perfect. Because the second movement must have some bite to it. Not a lot – just a little – but enough teeth to fuel the mini-rebellion that comes in the middle of the movement. For me, the music is about resigned grief – but not resigned without a fight! You know? So. Perfect. And I stood. On a quasi-related note, it occurred to me that of the four movements of the seventh, the third is my least favorite (which is akin to saying that of all the Narnia books, The Silver Chair is my least favorite; I’ve still read it like eighteen times). And that thought led to another: of the four movements of Schubert’s “Death and the Maiden” string quartet, the third is – wait for it – my least favorite. The Shostakovich Piano Trio No. 2? Least favorite: third movement. In fact, no third movement springs to mind for which I harbor a particular fondness. What gives? Do you agree with my assessment? Or can you correct me with some fantastic third movement examples? Note: The below post has been slightly modified from the text as it was originally published. If you’d like to see the full version, email me. Last Saturday my dear friend Rebekah and I hiked over to the Meyerhoff to take in the Baltimore Symphony Orchestra’s season-opening gala. I could just straight tell you what I thought, but I figured why not switch it up a bit? So here’s Rebekah and I indulging in a little post-concert discussion. Rebekah is a cello teacher and Peabody musicology grad student, so she’s more than qualified to weigh in. Two opinions for the price of one — how can you resist? Jenn: First of all, I want to say that the absolute best part of the concert was when David Little almost knocked out Hilary Hahn by accident. Rebekah: The surprise on her face was the best part because it was so genuine and she seems so nice. J: Like a little elf! R: I think she looks adorable! J: The concert opened with Copland’s Fanfare for the Common Man, which is of course a seminal work, and it always kinda gets me. I’m a documented sucker for horns. Alsop took the opening a little fast for my liking, but those horns were gold. R: I actually… well, when you say fast, you mean she took it fast or she started the concert fast? Tossing LOL Friday again today for a recap of last night’s Die Zauberflote. Regular LOL Friday format to return next week, assuming I don’t have something else I feel like talking about. We’re going to a do this bullet point style, because I had a rough day yesterday. Thank heavens it was a comic opera and not, say, Tristan und Isolde. Two TVs set up in the orchestra tier that focused on Marin Alsop’s conducting. I assume so that the vocalists could see her instructions while still facing the audience? They were turned off for awhile, so I’m not 100% sure. Opera people, enlighten me. Not being so well-versed in opera and having seen little of it live, I found the dichotomy of the listening experience. The BSO itself, usually at the forefront of my attention, becaming a supporting player I scarcely noticed as I focused on the vocalists. Which I suppose is the way opera is supposed to be — you only notice the musicians if they make a mistake — hence their relegation to the pit. But it’s not how I’ve been accustomed to listening to live music, so it was a different experience for me. The girls got pretty dresses and veils that fit their roles; Papageno (Daniel Chi, I think? they announced him as a replacement and I’m not sure Daniel Cilli) got a vest and feathers in his hair; the rest of the men got… tuxedos. Yes. Because when I bolt off on heroic quests, I always shake out my tuxedo first. I really wanted to swap Tamino (Jonathan Boyd) in for Papageno and vice versa. Both were good in their roles, but Tamino was just too… verklempt in his gestures for my taste. I understand that, what with the fainting and all, Tamino is not supposed to be the perfect protagonist, but still, I think he’s supposed to be more amusing in the ridiculous ideal he represents. I found him inherently silly, and that would’ve done well for Papageno. By contrast, Papageno performed his funny business very well, but there was a lanky elegance about him that I think would’ve better suited Tamino. All the same, he did a great job when he was trying to find a girl to kiss — both in a hanging scene and the part where he came on to Marin Alsop (bahahaha). But forget them — I’m throwing in my lot with the Queen of the Night (Mari Moriya). Did she hit those high notes? Yes she did! Although oddly enough I found her lower notes leading up to it a teensy bit inaccurate; nervous anticipation, perhaps? Her three ladies were also pretty fantastic. The Three Spirits were repeatedly referred to as boys. Note to costume designers: throwing cummerbunds and caps on what are clearly girls from an anatomical perspective does not turn them into boys. I found Monostatos (Peter Joshua Bourroughs) the weakest of the cast — he had a very nice voice but didn’t project like he needed to. I loved his red Chuck-wearing, jump-roping henchmen, though. Sarastro (Morris Robinson) could project his voice ANYWHERE IN THE WORLD. Pamina (Emily Albrink) did a good job. That’s all. Next! In the immortal words of Tigger: It’s the Narrator! There was an explanatory narrator, since this production was only semi-staged and cut a bit. His name was Tony Tsendeas, and he did a great job with a potentially cheesy role that was essentially made up and included a stint as a hanging tree. Well done, sir. “Nein, nein” is funnier than “Ja, ja” when sung. Fact! So. Yeah. You should go see it at the Meyerhoff this weekend. Bonus post! Just wanted to dash off a quick concert recap, since I attended the BSO concert with Ingrid Fliter last Friday. See? It was good. And as my dad always says, the excellent is the enemy of the good; I must confess that I was a trifle disappointed. Don’t get me wrong — everyone sounded beautiful, Ingrid Fliter played very nicely (although I preferred her brief encore to the Chopin concerto itself), it was all very nice. But there was no fire, no passion, no oomph. It was phoned in. To that I say: so what? Unfortunately, a blase approach simply cannot work with these two pieces. William Tell is something of a cliche, I will grant you that. It still makes me smile, but I will grant you that just the same. However, it is a piece that calls for raucous energy by its very nature, and the version I heard was controlled, almost tired. As for the Tchaikovsky, it is called the “Little Russian” at least in part because of its roots in Russian folk tunes. Folk tunes — especially, I would even venture, eastern European ones — are raw chunks of emotion and spirit. This was not. This was beautifully played, yes, but strangely full of ennui. What I find extra funny is that for Tchaikovsky, it’s way less Tchaikovsky-y than usual. Shouldn’t that make the Tchaikovsky snobs feel better and more excited? I don’t know. Maybe the guest conductor Hans Graf was confusing them or something, although I wasn’t bothered by the tempi or dynamics. Everyone has an off night, I suppose, but let that be a lesson to you — even if it’s the thousandth time you’re busting out Pachelbel at your second cousin’s wedding, make like your aunt just gave you an ugly sweater for Christmas and fake some joy here, people! Last Saturday I had the privilege of attending — along with so many others there weren’t enough programs to go around because these guys are that good — a performance by the Gemini Piano Trio at Howard Community College. The concert was the first in a series of “dress rehearsals” of sorts before their big night at Carnegie Hall next weekend (hotcha!). They opened with a Beethoven piano trio with a slow movement as only he can write and ended with a nice Mendelssohn concerto that I couldn’t really concentrate on. This is because what happened in the middle was, much like an Oreo, the best part. The Gemini Piano Trio’s recorded version is spectacular, and the performance on Saturday was excellent. Indeed, it had even more fire — more hidden rage — more anguish at a higher intensity than ever before. Music with a gun to its head. As the fourth movement approached its big climax I could feel it rising in my chest and giving me the shakes. However, this is where I hop up on my soapbox, because while all the needed passion was there, it was also pockmarked with intonation problems and flubbed chords. Not a lot, mind you, but they were there, probably more because of nerves than anything else. And yet somehow they got a standing ovation. Okay. I don’t mean to single the Gemini Piano Trio out here. Of the concerts I’ve been to in the last… years, really, it was one of the best. But this is the culmination of what I consider to be a disturbing trend. At every single one of those aforementioned concerts, THERE HAS BEEN A STANDING OVATION. GUYS. Guys! The standing ovation is not something you should be throwing around like a gold star sticker you can buy in sheets of fifty. It’s a big deal. It’s supposed to mean something. And yet every time the performers do a great job you give them one. A great job is not ENOUGH. The standing ovation should be reserved for the exemplar, the apex, the acme, the untouchable, the infallible, the supreme. Like it? Good. Really like it? Nice! Love it? Fantastic! Did it change your life, move you to new heights, make you feel the way you have never felt before and may never feel again? The confluence of perfection and a musical moment where time stands still – THAT deserves a standing ovation. No less. If Shostakovich had been there that night to take his composer’s bows, I would have given HIM a standing ovation. What he created is perfection in time. For those who choose to perform his work, I expect you to match him note for note. Until then, you will receive only my sincere applause (take heart – I give this grudgingly enough as it is). And for the musicians of those concerts I shall attend in the future, if I do not stand up, it does not mean I didn’t truly enjoy it. You see, until such time as the rest of the concert-going crowd decides to take my view of things, I shall be grading standing ovations on an even harsher curve. Someone’s got to keep the universe in balance. 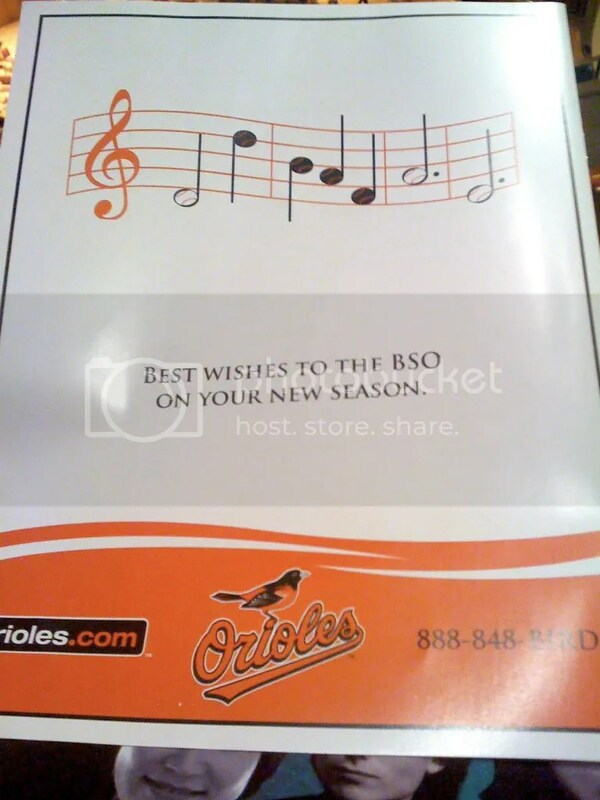 If the Orioles have a longstanding relationship with the BSO, don’t tell me. I want to pretend that I singlehandedly sparked the idea for this partnership in this post. Go O’s! All right, Baltimore Ravens. Time to step it up. Best BSO concert I have ever attended. I attended the BSO’s Gala Celebration concert on Saturday evening, and although it started with about half an hour of people promising their speeches would be brief and completely failing to deliver on those promises, the music that followed made it absolutely worth it. First was a short piece by Ginastera – very nice – and then a few of the more famous bits from Bizet’s Carmen. The latter were accompanied by flamenco dancers, and in that I learned that flamenco is really not (to my untrained eye, mind you) a solo sort of thing. The woman looked okay, but the man dancing alone looked absolutely ridiculous; flourishes and stomps that fit beautifully when partnered looked like bizarre interpretive dance unaccompanied. Maybe I’m just a philistine, I don’t know. Then came a short piece by Villa-Lobos, an entirely unexpected work orchestrated for a single soprano surrounded by a gaggle of cellos, then an allegretto by Rodrigo with a quartet of guitarists. Interesting, pretty, but only foreplay for the highlight of the evening: Nadja Salerno-Sonnenberg soloing in the incomparable Astor Piazzolla’s Four Seasons of Buenos Aires. I had never heard of Salerno-Sonnenberg prior to this (although I’d probably heard her play on the radio before unknowingly); as soon as I mentioned her to my mother, however, she (my mother, not Signorina Nadja) immediately declared herself a big fan. So I had high hopes. I may catch a lot of flack for this comment, and even more so for the fact that I mean it as a huge compliment: Nadja Salerno-Sonnenberg plays like a man. I partially mean that physically: eschewing the usual concert gown, she came out in glittery pants, which allowed her to spread her legs a few feet apart and hunker into the violin like a football player awaiting a pass. She swayed and stomped, and when she played, she wasn’t gently caressing the notes, she was fighting and conquering them. So often this is a bad thing – you don’t generally want to battle the music – but this was no struggle. She was clearly certain of her victory, and as such enjoying her path to triumph; every stroke of her bow was a deeper sink of her teeth. I thought it was absolutely magnificent. As for the Piazzolla itself, it was more classical than I would have expected – I tend to associate him with the bandolin-infused fusion of Maria de Buenos Aires – but it was laced with whimsy and abnormal uses of the music, with lots of scratching at the frog of the bow. Thoroughly enjoyable and I intend to hit it up on iTunes, but I question the inclusion of Vivaldi; the piece is listed as inspired by Vivaldi’s Four Seasons, not sampling it. Sure, it provided a few laughs of recognition, but ultimately I feel it took away from the piece. For the finale, a Spanish dance by Manuel de Falla, which invited back Salerno-Sonnenberg, the guitar quartet, and the Flamenco dancers. Very well done indeed, but a decided comedown from the Piazzolla. Nevertheless, a fantastic concert, and if you missed it: you idiot! Not to worry, though – after next week the BSO season starts up again for real, and I’ll be keeping you informed. Does anyone know of any more Baltimore/DC area performances by Nadja Salerno-Sonnenberg? I’d really like to hear and see her play live again.